The Times Of India: HYDERABAD: The Hare Krishna Movement (HKM) in Hyderabad, that has been serving free food to patients and attendants at Indo American Cancer Hospital and Niloufer Hospital for the last three months, will now be extending the service to the state's two biggest public hospitals, Osmania and Gandhi. Officials of Hare Krishna Movement, that comes under Iskcon Bangalore, said here on Tuesday that they would be catering to at least a 1,000 people at Osmania General Hospital from September, when they start their free meal service there. "We have been giving out about a 1,000 meals to attendants at Indo American and Niloufer and wish to extend that to other hospitals. We are going by the ideology of our spiritual master Srila Prabhupada that no one should go hungry in a 10 km radius of a temple," said Ravi Lochana Dasa, an HKM official. The Hare Krishna Movement has a kitchen in Patancheru where it cooks food not only for hospitals but also to provide food as part of its mid-day meal scheme to government school children. Officials at HKM said that 65,000 children in more than 300 government schools spanning 12 mandals are served as part of the programme. 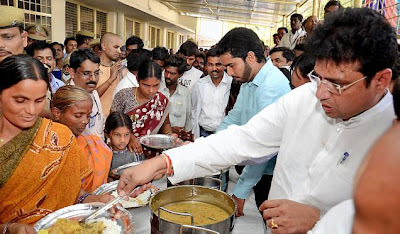 As hundreds of attendants, most of them from poor socio-economic background, throng state-run hospitals everyday, the free food initiative called 'Bhojanamritha' has been rather well-received. "Our in-patient strength is 1,000 and the government takes care of just their food. But there are many people who come here, the attendants, who are not provided food," Daruru Ranganath, superintendent of Niloufer Hospital, said.